Your eyes can now be examined in previously unimaginable detail. Hopefully you have previously had photographs taken of the back of your eyes - the retina. The OCT takes this further. 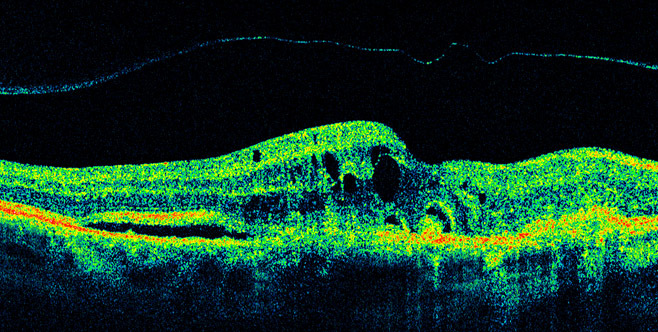 Using a low frequency light source the OCT will scan sections of the retina and generate a 3D, cross-sectional scan in one sitting. It is non-invasive, painless and quick! The images are stored for future reference, and compared to your next scan to monitor the health of your eyes. We can diagnose and monitor eye conditions including vitreous detachments, glaucoma, diabetes, macular holes, age related macular degeneration (ARMD) and much more. This allows us to manage our patients effectively and help them to prolong their vision. ﻿ARMD ﻿is an age related condition affecting the central part of the retina. This means objects in front of you are distorted or absent, but the peripheral vision remains normal. One of the early signs of ARMD is drusen. With OCT we can see these early on and recommend changes to reduce their progression. If the patient has a certain type of ARMD known as Wet ARMD then fluid builds up in the retinal tissues. This in the early stages can be very subtle, and OCT would be the only tool to detect this. Epiretinal membranes can affect the macula area causing distortion to central vision. The membrane is an extra piece of tissue which sits on top of the normal retina and causes it to wrinkle, resulting in distortion. OCT allows better visualisation of this structure and enables close monitoring. Here is a video of the 3D modelling of an Epiretinal membrane on one of our patients using the OCT.
Glaucoma is a condition which affects the nerve fibres between the eye and the brain. We see these changes at the optic disc. Before the advent of OCT, glaucoma was detected only by measuring eye pressure, assessing the visual fields and by observing the optic disc. This meant a moderate number of nerve fibres had to damaged before diagnosis. With OCT the diagnosis can be sooner with a reduced number of damaged fibres and therefore prolonged vision. OCT allows us, for the first time, to measure the nerve fibre layer thickness. So if there are any changes we can manage it sooner. 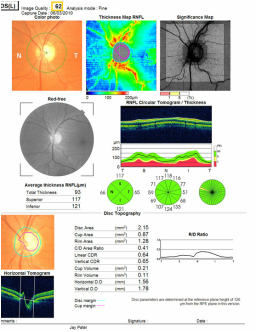 Optic disc reports provide us with a significant amount of data to facilitate glaucoma diagnosis. As one of the first practices in the country to benefit from this new technology, we are pleased to be able to offer the highest standards of care to our patients. Prevention is always better than cure, and early detection and treatment of disease might save your sight. How much does an OCT scan cost? The OCT scan is £35.00 and we think represents value for money. Other practices in the UK charge the same or more, however our fee represents our commitment to provide the best eyecare at a fair price. At Martin Reynolds Opticians we are at the forefront of innovation, being one of the first to take advantage of this new technology. However we do understand some of the more established techniques are the best, so we use the best of traditional and advanced techniques to provide the most comprehensive eye examination we can. At Martin Reynolds Opticians we value you and your vision. To book an appointment come in to the practice or phone us on 01279 757767.